Your teeth and gums work together to create a beautifully balanced and healthy smile. When one is unhealthy, it can negatively affect the other. It is estimated that 90 percent of Americans over the age of 30 have at least one cavity. That means nine out of every 10 people you come in contact with most likely have a cavity, making it a common health concern. While it may be the norm to discuss cavities among friends and co-workers, one oral health concern that is just as serious but less talked about is gum disease. This chronic gum infection affects roughly 50 percent of Americans. Sadly, many are unaware they have the issue until it is in its more advanced stages. Some of the more common side effects can include chronic bad breath, red and swollen gums, gum recession, gums that bleed easily, and tooth pain. Untreated gum disease can result in tooth loss, and serious physical health issues, such as heart disease, diabetes, and stroke. Taking care of your gums can help protect both your oral and physical health. 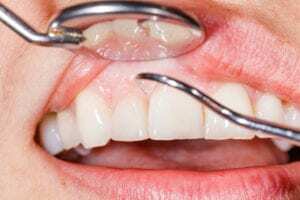 Though dental fillings are the number one treatment provided in most dental offices to treat cavities, some of the treatments used to treat gum disease are growing in frequency. Discussed below are three common gum disease treatments that are performed at our Denver and Lone Tree locations to help improve gum health. If you are concerned you may be suffering from this oral health concern, it is vital that you contact us today online or by calling 303.534.2626 to schedule your consult. Scaling and root planing is generally performed as part of a deeper cleaning to help treat the initial stages of gum disease and gum recession. If gums are sensitive and sore, the hygienist can administer a local anesthetic to ensure optimal comfort. The hygienist will then use a scaler to remove plaque buildup and trapped bacteria between teeth and below the gum line. When gums recede away from the base of the tooth, it not only creates an unbalanced smile, but it can lead to severe dental sensitivity and increase your risk for tooth decay. The grafted tissue will integrate with the surrounding area and promote healthy regrowth. Once your gums heal, you will notice a healthier-looking smile. When gums are severely affected, it may be necessary to remove the infected tissue in order to protect nearby teeth and gums. The level of gum surgery required will depend on the severity of your gum disease. If you notice anything unhealthy or unbalanced about your smile – it’s important that treatment is sought immediately. Catching gum disease in its earliest stages can reverse symptoms and protect your smile. Contact our Denver or Lone Tree office today online or by calling 303.534.2626.